Having your hearing evaluated should be something all adults over the age of 60 need to prioritize, as one and three adults between the ages of 65-74 have some degree of hearing loss. The longer the hearing loss goes without being diagnosed, the higher your chances of having complications as a result of untreated hearing loss. To assist you in managing your hearing loss, you can have a hearing evaluation at Hearing Associates of Las Vegas. Our hearing specialists are highly experienced and can provide you with an in-depth hearing test to evaluate whether you have hearing loss, and to what extent the loss is affecting you. Unlike a hearing screening, where you undergo a quick pass/fail test, a hearing evaluation is considerably more comprehensive. Since it identifies what type of hearing loss you have, what degree of hearing loss is present, and other key factors, it is important to have yearly hearing evaluations, as hearing screenings aren’t enough to diagnose anything. To help you understand what a hearing evaluation at Hearing Associates of Las Vegas will be like, below are the general stages of our hearing testing process. Before you jump into any testing, our hearing instrument specialists like to sit down with you for a pre-hearing evaluation consultation. You are welcome to bring someone with you to your hearing evaluation to help you remember everything that will be discussed and to provide insights you may not have noticed. During this consultation, our hearing specialist will discuss with you various things such as what brought you in for an evaluation, your medical history, and other topics to gain an understanding of how hearing loss may have already impacted your life. To start the testing, our hearing specialists will check your ear canal and tympanic membrane (eardrum). It is possible to have cerumen (earwax) blockage, which can lead to temporary hearing loss. However, if left untended, cerumen can damage the tympanic membrane, leading to permanent hearing loss that can’t be corrected without hearing loss. Also, in some cases, hearing loss is caused by damage to the tympanic membrane. After our specialists check your outer ear and the visible portion of your middle ear, they will move onto to the next portion of the hearing evaluation. Pure tone testing – With headphones on you, our hearing specialists will play various tones. As these sounds are played, our hearing specialists will ask you to indicate when you hear them. These tones will be at different volume levels and pitches to assess if there is any high-frequency hearing loss, and at what volume level do you start to be unable to hear clearly. 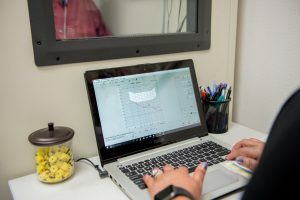 Bone conduction testing – To assess how the sound-conducting bones behind your ears are functioning, our hearing specialist will place a device behind your ears. Like the pure tone test, you will be asked to indicate as you hear the tones played by our hearing specialists. Once the sound-specific tests are completed, our hearing specialists will have you go through a couple of speech hearing tests. Speech reception – Our hearing specialists will assess your ability to hear spoken words. As hearing loss can make it difficult to hear certain consonants, this test will check if your ability to perceive speech has become impaired. Word recognition – Untreated hearing loss can also make recognizing words difficult, as the connection between the ear and brain is damaged by hearing loss. Our hearing specialists will check for this issue by saying a series of words and asking you to repeat them. If you brought someone to your hearing evaluation, our hearing specialists may ask them to read off a list of words. This test can help assess if your hearing is more attuned to those who you are used to talking with regularly. After our hearing instrument specialists are finished with their tests, they will sit down with you to discuss the results. Sometimes, this consultation will simply confirm that your hearing is in good shape and our specialists will make recommendations to help keep your hearing healthy. When there is hearing loss present, our hearing specialists will discuss with you the extent of your hearing loss, and depending on what type of hearing loss you have, what options are available to correct the loss. At our hearing clinics, if you have sensorineural hearing loss, hearing aids are the best route to correcting your hearing loss. There are many different types of hearing aids available. 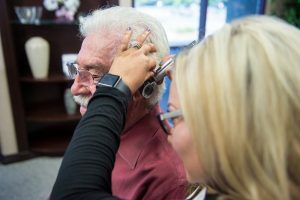 Our hearing specialists can help you determine what hearing aids are best for your hearing loss, and you can test several different hearing aids in our office! Once you have determined what hearing aids you prefer, the hearing specialist helping you will order in those hearing aids and contact you once they are in. Also, on certain hearing aids, we can also extend a trial period, so you can be sure that the hearing aids you have chosen are right for you in all circumstances. For a personalized hearing evaluation, you should be sure to come to Hearing Associates of Las Vegas. We do our best to make our hearing offices comfortable places where anyone can feel welcome, complete with a fresh plate of cookies available! If you are ready to take control of your hearing needs, you can visit us at one of our hearing clinics. Contact us today to set up an appointment with one of our hearing specialists!